Dan Ristau has never followed trends simply for the sake of fitting in. He has distinct ideas in his seemingly endless imagination and when turned into something tangible, those ideas can truly be a work of automotive art. Once you meet Dan you’ll realize that he doesn’t fit any sort of “car enthusiast” mold, other than his interest in modifying cars. Over 6 years ago, before Milwaukee’s streets became flooded with modified Subaru’s, Dan had his WRX looking mean and stylish. Dan has slowly built his car to some very precise and exceptionally high standards over these years. Unlike most show cars, Dan’s car doesn’t change very often. So when it does change, you know it’s because he found some rare parts that he’s been searching for at all corners on the dark, scary Internet. Or maybe, he noticed something wasn’t quite pristine. Dan originally purchased the car from a friend that was leaving to serve our country in Afghanistan. He soon put the car through some hard abuse at a few local autocross events. Dan wasn’t a fan of how often things broke and had to be fixed or replaced. 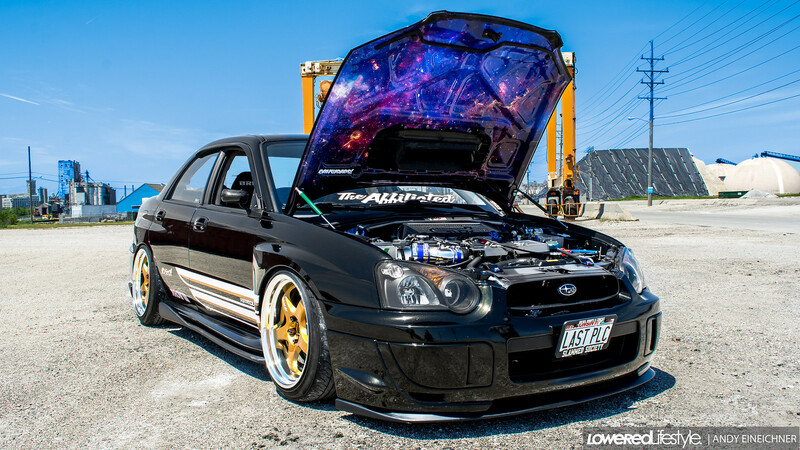 Soon after, he retired from his short lived autocross fling and focused more on outfitting his WRX with some cool parts like his Bride seats, Key!s Racing steering wheel with matching shift knob, and the array of rare ARC parts decorating his engine bay. Dan is constantly searching for more unique parts to really make his car standout amongst the sea of Subarus, and he’s doing a fine job. Being a fan of function as well as form, Dan didn’t make his car completely incapable. While it is fairly low, Dan took me on a ride around his town and didn’t hesitate to put the car through some spirited driving while traveling to our various destinations. Sure, Dan has acquired some rare parts, but he has also made some completely custom pieces for his car such as the suede interior paneling. 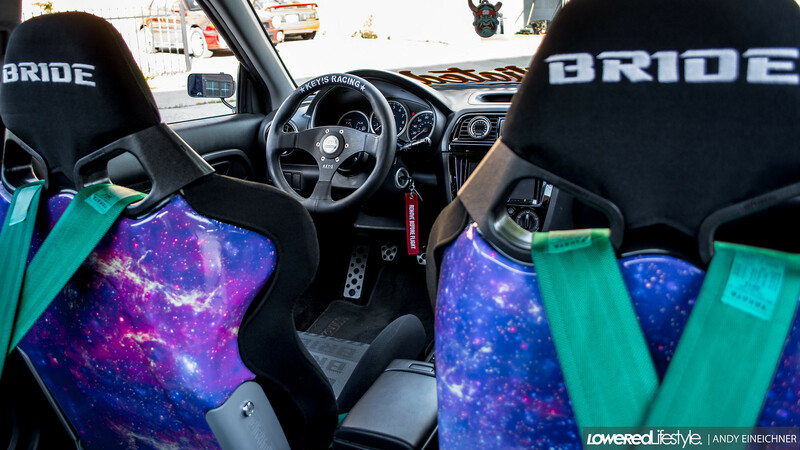 But perhaps the biggest standout piece of the car is the galaxy design vinyl wrapped seat backs and under-hood wrap that Dan did himself. It’s a small touch, but it goes a long way to contrast the dark warm tones of the rest of the car. You’ll never meet a car enthusiast quite like Dan, and that’s a good thing because If there’s ever been a rare or hard to find part that you have your eye on, it would be a safe bet that Dan can find it first, or maybe even owns it already. If you ever see Dan at a car event, go say hi and on a side note, the corgi doesn’t bite.